Un colier realizat din piele in culori vesele : violet, roz prafuit, albastru si fuchsia. Fiecare floare este taiata si prelucrata manual. Cateva floricele sunt vopsite si lacuite pentru protectie cu culori acrilice. Colierul este accesorizat cu cristale Swarovski si sticla Cehia pentru mai multa stralucire. Diametrul florilor: intre 2.5-5 cm. 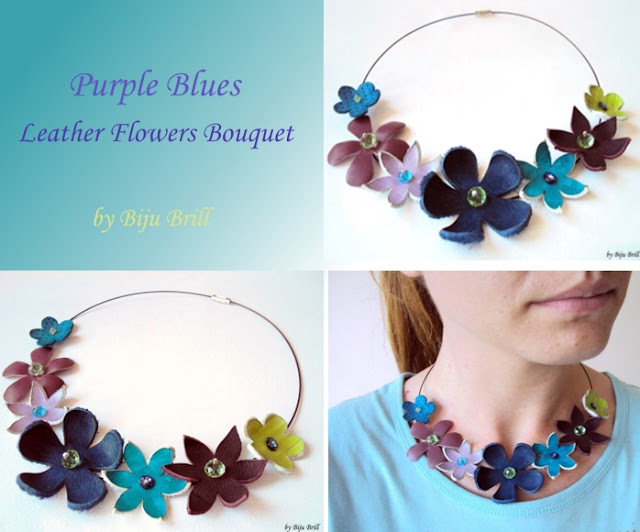 Beautiful and fun, this leather necklace is made in rich colors: purple, blues, fuchsia and soft pink. Each flower is hand cut and shaped . Some flowers are hand painted and lacquered for protection. Each leather flower has a beautiful Swarovski crystal or a Czech bead in the center that will bring more shine to the necklace. Fowers diameter - between 2,5 and 5 cm. Inel realizat manual din piele colorata si moale, accesorizat cu o perla Swarovski de 6 mm. Alegeti-va culoarea preferata: fuchsia, verde, turquoise,auriu sau orange. Poate fi purtat ca set cu cerceii Leather Roses Summer Stud Earrings. 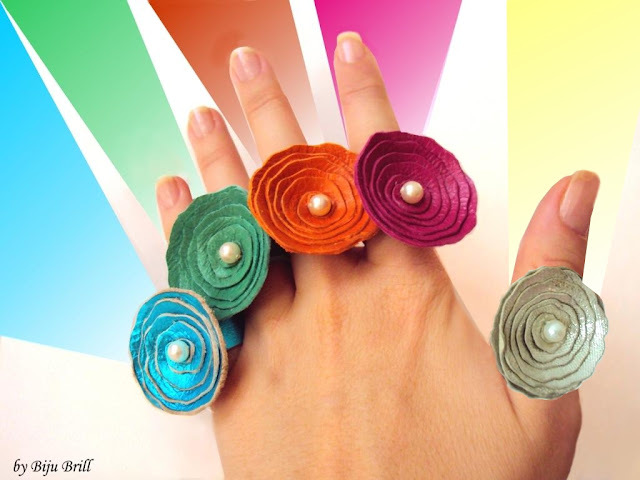 Handmade ring made with soft Italian leather , embellished with a 6 mm Swarovski pearl. Chose your favorite color: fuchsia, green, turquoise, gold or orange. They can be worn with Leather Roses Summer Stud Earrings. O pereche de cercei extrem de stralucitoare, realizata cu cristale Swarovski octogon de 14 mm. Culorile care sunt reflectate sunt albastru, galben, portocaliu violet, roz. Cerceii sunt placati cu argint şi au un link realizat manual din sarma placata cu argint, impodobita cu cristale Swarovski de 4 mm. Lungime 5.5 cm. A very eye-catching pair of earrings, made with a color-changing Swarovski crystal, shaped as an octagon. The colors that are reflected are blue, yellow, purple, orange, pink. The earrings are silver plated and have a beautiful handmade twisted drop, embellished with 4 mm Swarovski crystals.5.5 cm long . 14 mm Swarovski octagons. Un colier vesel realizat pentru Roroism din piele in culori contrastante dar complementare: violet pruna, lila, albastru, verde mar si turquoise. Fiecare floare este taiata si prelucrata manual. Cateva floricele sunt vopsite si lacuite pentru protectie cu culori acrilice. Colierul este accesorizat cu cristale Swarovski si sticla Cehia pentru mai multa stralucire. Diametrul florilor: intre 2.5-5 cm. Beautiful and fun, this leather necklace is made for Roroism in contrasting yet complementary rich colors: purples, blues, turquoise and apple green. Each flower is hand cut and shaped . Some flowers are hand painted and lacquered for protection. Each leather flower has a beautiful Swarovski crystal or a Czech bead in the center that will bring more shine to the necklace. Fowers diameter - between 2,5 and 5 cm. Emerald Drop Pearl Elegance Earrings - SOLD! Cercei realizati intr-o multitudine de nuante de verde, cu cristale Swarovski si perla naturala. Sunt extrem de delicati si feminini. Cerceii sunt din argint. Lungime totala: 3 cm. Earrings in multiple shades of green, with Swarovski crystals and freshwater pearls. They are extremely delicate and feminine. 3 cm long. Sterling silver ear hooks. Stralucirea acestei perechi de cercei este extrem de surprins in fotografie. Sunt extrem de eleganti si usor de purtat, mai ales intr-o zi atat de speciala pentru o femeie. Cristalele Swarovski sunt montate in suport argintat, iar cerceii sunt din argint si placati cu rodiu. Lungime: 3.5 cm. The brightness of this pair of earrings is very difficult to capture in a photo.They are extremely elegant and easy to wear, especially in a day so special for a woman. 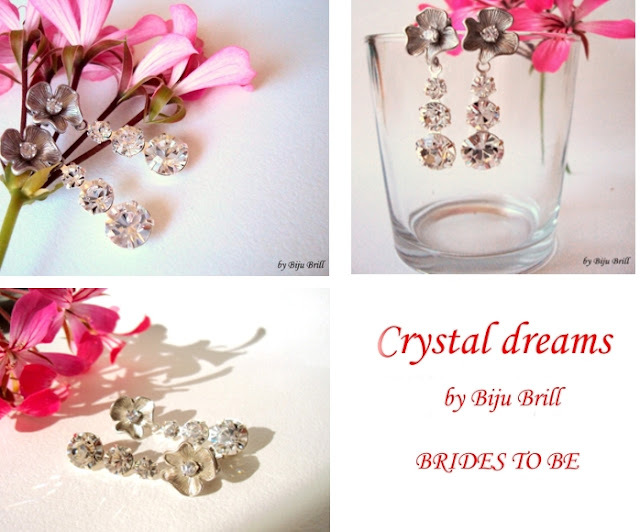 The Swarovski crystals are mounted in a silver plated setting and the earrings are sterling silver rhodium plated. Total length: 3.5 cm.